Less than two months ago, Apple users discovered a bug in macOS that allowed anyone to log in with root access. Apple apologized and fixed it quickly, but now users on Open Radar have found a similar (but far less severe) macOS password bug. If the padlock is unlocked, click to lock it. Click the padlock to unlock it. In the prompt, enter your username and any password. The App Store preferences pane should unlock. We tried it on a new iMac and MacBook Pro, both with macOS 10.13.2, and it worked. The bad news is that this is a really easy and fairly serious security vulnerability. The good news is that users running the 10.13.3 beta have not yet been able to reproduce the bug, so it's probably fixed in that upcoming release. This is also nowhere near as serious as the root bug was. 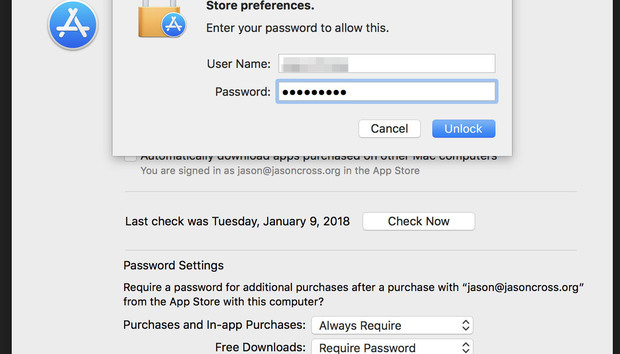 Allowing anyone with access to your Mac to access your App Store system preferences is bad, but it's not like it would let them rack up a ton of charges or steal your data (the most lenient setting for purchases is to require your password after 15 minutes). Later, Phil Schiller downplayed the notion that there were systemic problems at Apple. "We just had a bad week. A couple of things happened, that’s all." He once again promised to audit Apple's systems and processes to prevent this sort of thing from happening again. And yet here we are, not halfway into January, with another "they really should have caught this" bug. While it's not nearly as serious as those of the infamous "bad week," it's still an amateur-hour mistake that makes it easy to question Apple's renewed commitment to quality.